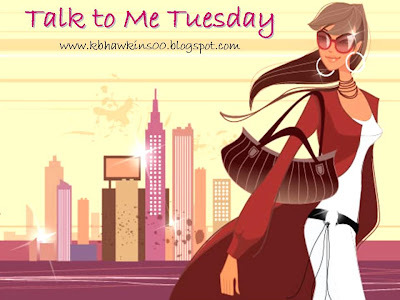 So for my inaugural Talk to Me Tuesday post... I thought we'd talk about this wonderful world that connects most of you to me... blogging. It's so interesting to me how my plunge into the world of blogging took place... I remember starting a news blog at one of my old jobs to pass information around without clogging up everyone's inbox. Which made me start thinking about the "mass emails" that I sent to family and friends when big things happened in our little world. So, I initially started a blog to keep my family and friends updated on our happenings - and it didn't really take off. At that point, I was paying for it - and it was before blogging became a big new thing... I got the bug again when I found out that you could do it for free... and I had more interesting things going on - like weight loss surgery. I started writing about my experiences while trying to navigate the crazy maze of insurance hoops that were needed to get weight loss surgery covered - only to get to the end of the maze to find that our insurance policy never intended to cover it. I digress, as I moved through the process - people started following my blog that weren't family or friends... but they quickly became friends! As I then took the plunge into the world of fertility treatments for the second time - which really could also be considered the first time...since our initial doctor fired us before ever even trying to treat us. I met some more wonderful women who I have grown to call friends. I truly have met some kindred spirits through the world of blogging... very special women that I can only hope and pray that I will get to meet at some point in my life... I can imagine the laughing and late night chatting that would happen if we did get to meet. That is if I got up the courage to show up - but I know that some of you know me well enough to push me on that... and I know that I wouldn't regret it, and would probably count that experience as one of the best in my life. As always - feel free to grab the image and join in the party on your own blog... just leave me a comment and let me know you're doing it so I can pop over and see what you write! I can't remember what my specific reason was, other than I've always loved writing and wanted to do more of it. I didn't have a specific audience at the time or any particular subject to write about, nor any clue as to how I would find other blogs or they would find me. It just sort of...happened. I've never made my blog public to my friends. A few family members know of it and some long-time friends that I've known for years that won't see my writing as objectionable in any way. Now it's part of my life. I love sharing my thoughts and opinions with others. And even just the random stuff. It really is a community of fabulous women, some of which have become great friends. I was amazed at how many bloggers out there were doing so in the name of Christ, for His honor and glory! Women who are committed to God, their husbands, their families and their ministries. That lone has made it an awesome journey! Hi, my name is Danielle and I'm a quiting ADDICT. I wake up thinking about it, and I go to bed thinking about it. When I'm not sewing, I'm thinking about what I would be sewing. Really, it's kind of ridiculous, but truly, I'm consumed with it and am gaining momentum daily. I decided to start a blog because I started noticing how all these bloggers formed a community, and that's what I wanted. I wanted to show someone what I made and also see what they made. It can be lonely in my sewing room, but through blogging, it's like I'm with friends. The other attractive thing about blogging is that I have a four year old and a husband who works kooky hours. Because of that, I'm pretty tied to the house. I can't join quilting bees, because my husband's schedule isn't predictable. So, I'm stuck at home, but once again-- it's not so lonely without all you guys out there. One last thing about my blogging life. When I walk into a quilt shop or a quilt guild, the stuff there quite often just isn't my style. I like modern quilts. Through the internet, I've been able to find many quilters who share my vision. I started blogging when my closest adult friend died from breast cancer. It's hard to fill that emptiness and hard to make friends as an adult without seeming 'desperate'. So...I started a blog and found friends all over. It's really been a blessing!